According to its engineers, this will be the tallest skyscraper in the world by the end of March of 2013. Its name is Sky City, and its 2,749 feet distributed in 220 floors will grow in just 90 days in Changsha city in China by the Xiangjiang river. Ninety days! It's not a joke. According to the construction company, the skyscraper will be built in just 90 days at the unbelievable rate of five floors per day. Foundation work is beginning at the end of the month, once the Chinese authorities give the final go ahead to the project. They will be able to achieve this impossibly fast construction rate by using a prefabricated modular technology developed by Broad Sustainable Building, a company that has built 20 tall structures in China so far, including a 30 story hotel built in just 15 days. Since they built that hotel, the company has been perfecting their technology, which they are now claiming will turn their project into the world's tallest skyscraper in just three months. That's a whooping five floors per day, which seems just absurd. Its final height will be 2,749 feet high. Sky City will use an astonishing 220,000 tons of steel. The structure will be able to house 31,400 people of both "high and low income communities". The company says that the residential area will use 83-percent of the building, while the rest will be offices, schools, hospitals, shops and restaurants. People will move up and down using 104 high speed elevators. The record figures don't stop there: in addition to the 90-day construction time—as opposed to the 210 days initially reported by the Chinese media—the company claims it will cost $1,500 per square meter, considerable less than the $15,000 per square meter originally thought, all thanks to the prefab technology. They also claim it will be able to sustain earthquakes of a 9.0 magnitude and be resistant to fire for "up to three hours," as well as be extremely energy efficient thanks to thermal insulation, four-panned windows and different air conditioning techniques that were already used in their previous constructions. To be honest, it all seems like a tall tale to me—no pun intended. Although the credentials of the company seem to be quite serious, one thing is to build a 30-story hotel in 15 days and the other is to built the largest skyscraper in the world in 90 days. 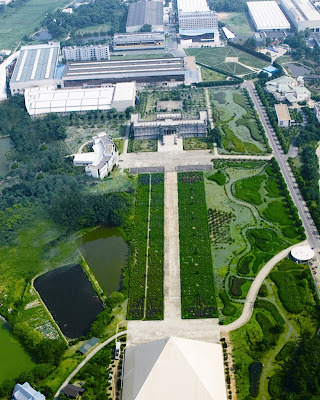 This the headquarters for Broad Sustainable Building in China. Check out the pyramid at the bottom!